The NBA Western Conference Finals featuring the Houston Rockets and the Golden State Warriors is now tied 2-2. The two teams have alternated victories in this series, and it was the Rockets winning game 4, 95-92. Houston has now reclaimed home court advantage in what now will be a best of 3 series. This series is featuring the two best teams in the NBA, but there has been little drama until game 4. The Rockets were able to hold off a late rally attempt from the Warriors to end Golden State’s 16 game home playoff win streak. The series now shifts back to Houston for a pivotal game 5. The Golden State Warriors are +1.0 against the Rockets in game 5. The Golden State Warriors had another huge third quarter and took a 10 point lead into the 4th quarter of game 4. The Warriors looked to be in great shape to take a 3-1 series lead, but the offense came up short late. Golden State got great play from Stephen Curry and Kevin Durant in the loss, but Klay Thompson continues to struggle. Thompson finished with just 10 points in game 4, and the Warriors will need him to make shots in game 5. The Warriors were also playing game 4 without the services of Andre Iguodala. 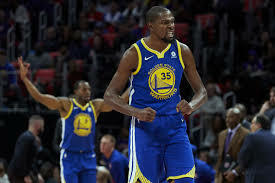 If Iguodala is unable to return for game 5, more pressure will be placed on the “Big 3” of the Warriors to lead their team on both sides of the ball. Coach Steve Kerr will have to find the right combination of lineups to place on the floor in game 5 to give the Warriors a chance to steal a game on the road. Probable MVP, James Harden, continues to torment the Warriors defense. The Rockets routinely set ball screens to set up isolation plays for Harden, and he has been able to take advantage of favorable matchups in this series. Harden poured in 30 points in the game 4 victory, while his running mate Chris Paul added 27. These two all-star guards look primed and ready to lead the Rockets to the NBA Finals. Eric Gordon also game the Rockets a huge lift off the bench in game 4. Gordon scored 14 points in the victory, including a huge 3 pointer late in the 4th quarter to give the Rockets some space. Coach Mike D’Antoni has shrunk his rotation down to just 7 players in this series, but the Rockets appear to have enough firepower between those 7 guys. The Warriors are now in a tough position, but it is a position that they have faced and overcame before. The core of Golden State knows how to win key playoff games on the road, and they won’t back down from the challenge. If the Warriors make shots at a high rate in game 5, they will be able to steal the game. The Rockets turned up the defensive intensity in game 4, but it is yet to be seen if they can do this in back to back games. The Rockets can score points with the best of them, but their defense has been questioned all year. Look for this to be a high scoring affair, but the Warriors have too much firepower for the Rockets to keep up. Golden State goes into Houston and wins game 5. Bet the Golden State Warriors +1.0 to win game 5 and take a 3-2 series lead.